One might assume by calling this a “Buddha Bowl” I’m making some kind of political or religious statement, when in fact, I am not. I just like giant bowls of food. That’s my kind of dinner. Let’s do this! 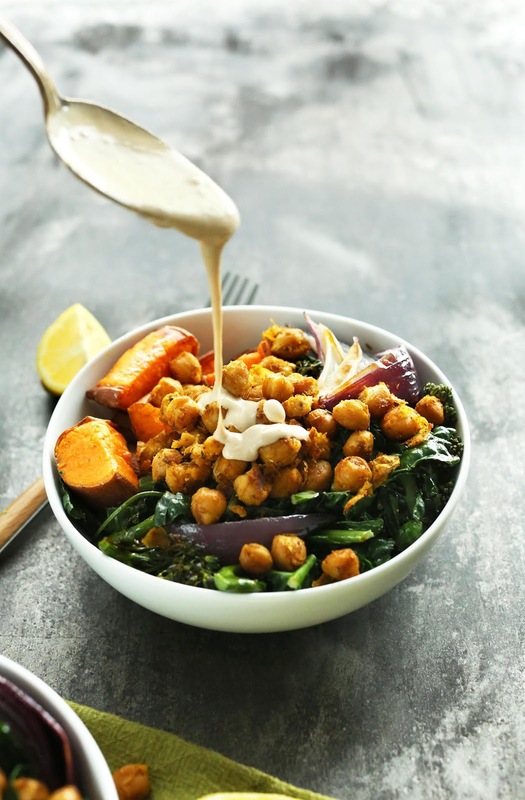 Flavorful, filling, 30-minute Buddha Bowl with roasted sweet potatoes, onion, kale, crispy chickpeas, and an AMAZING tahini-maple sauce! A healthy, satisfying plant-based meal. Once hot, add 1 Tbsp oil (amount as original recipe is written // use half of total amount if altering batch size) and chickpeas and sauté, stirring frequently. If they’re browning too quickly, turn down heat. If there isn’t much browning going on, increase heat. I found 10 minutes total at slightly over medium heat was perfect. *Nutrition information is a rough estimate calculated with sauce. 0 Response to "SWEET POTATO CHICKPEA BUDDHA BOWL"